Really? I’m not sure this “changes modeling” at all. It just adds something to the mix… The Kendall Jenner Effect: How Social Media Is Changing Modeling – MTV. Ásdís Jóelsdóttir´s lecture about Icelandic lopi wool and the development of the well know lopi sweater was very well presented. She spoke about how the consumer fashion world in Iceland changed in the 20th century leading to more local manufacturing and local design. She related the history of the SÍS monopoly which changed the way farmers got their products to market. With a central location for sheared wool to be collected, cleaned, spun and distributed the woolen industry grew. 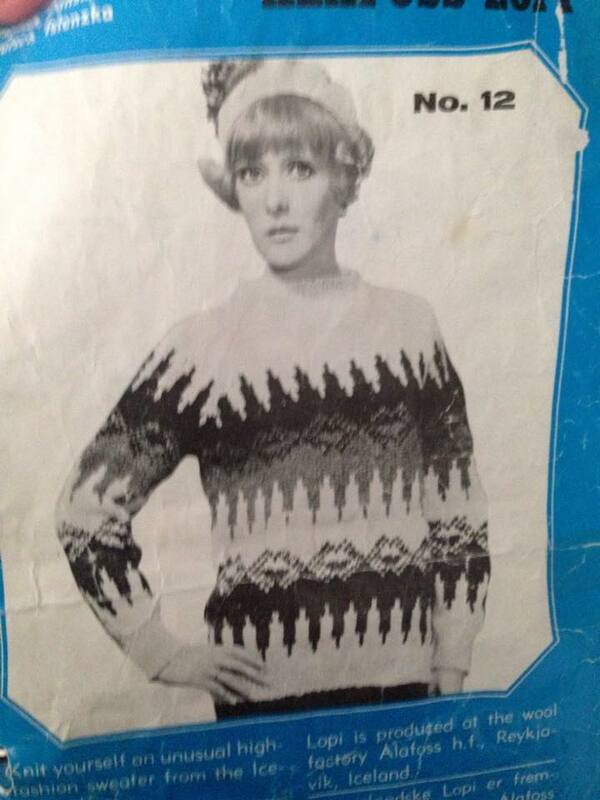 This is the instruction booklet for the first lopi sweater that I ever knitted. My grandmother sent the kit for this sweater to me in Maryland. This was in 1968 or 1969. The Álafoss kit contained enough skeins of Álafoss lopi (three ply) bulky yarn in 100 gram skeins required to finish the sweater. The main color was natural white and the pattern colors were natural black and natural gray. I still have the sweater although it is packed away in storage right now. I have always loved this sweater because of it´s unique pattern and because it was the first sweater I ever knitted. I still knit lopi sweaters for my family when needed. Steinunn´s uses the natural beauty and stark nature of Iceland as inspiration for her designs. Her designs are interesting and unique but more suited for the catwalk and celebrities. Although I personally found the number of slides to be overwhelming, I found the juxtapostion of pictures of raw Icelandic nature with end product, the clothing design inspired by nature inspiring. The presentation itself was way too long and became monotonous with no leeway for questions or comments. Met Ball 2015: celebrities arrive on the red carpet – in pictures | Fashion | The Guardian. Weiner, Edrich, & Brown, Inc.